I wholeheartedly believe in buying couple’s gifts off of their wedding registry. We took a lot of time picking out the items on our list, thinking about what we needed to make our place a home. On the other hand, I really like giving a personalized gift. 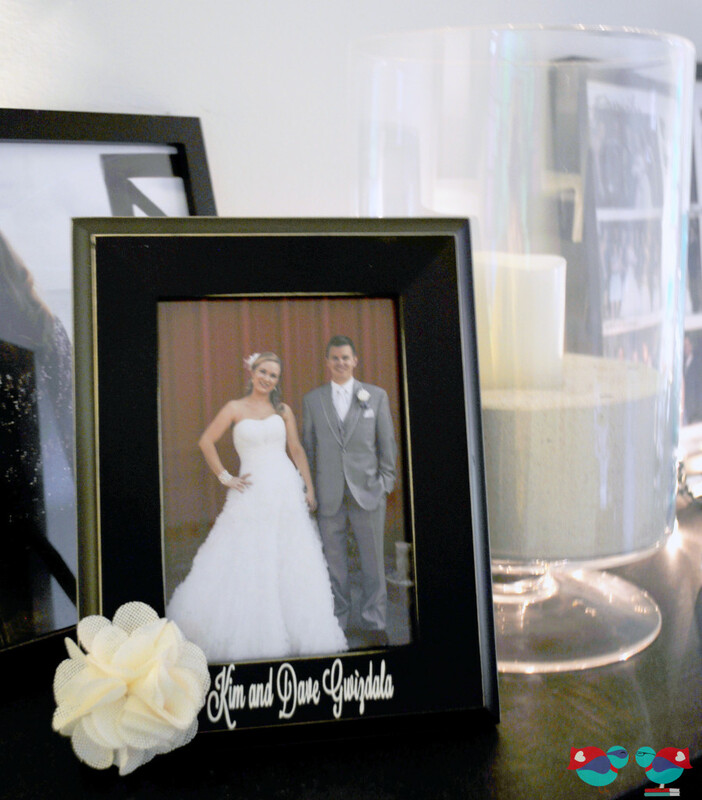 Some of our favorite things that we got for our wedding were the personal touches, the hand-made and thought felt gifts – like a cross stitch sampler from my sister, a personalized frame from my cousin, and a thoughtful wedding statue from my parents. I made this frame for a friend who got married in June. I bought the flower from Joann in the paper embellishment section and picked up the slightly distressed frame from there as well. Then, I used my Silhouette to cut out their names in vinyl. 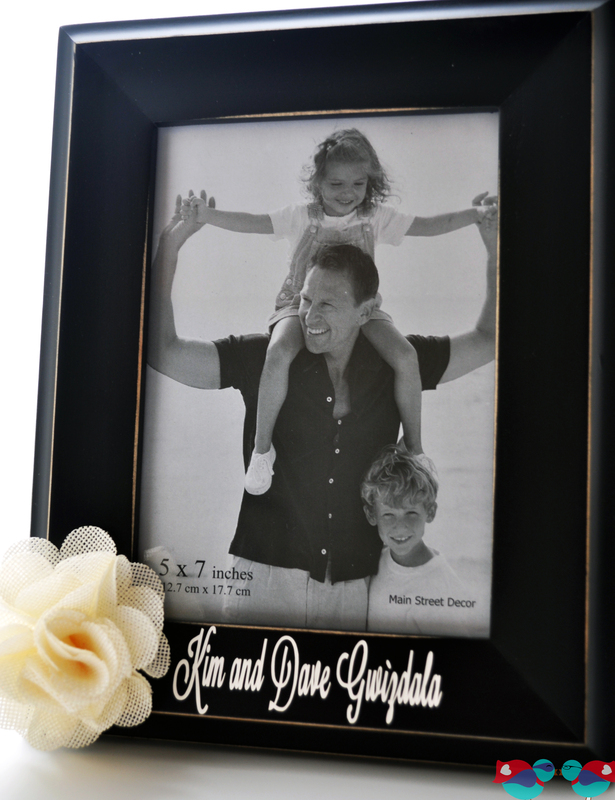 A frame like this would also make a great birthday or Christmas gift. Now, this picture below is obviously NOT Kim and Dave, but I thought I would get a picture of a couple in the frame. Too bad we don’t have more natural lighting in our place for pictures – instead, we have a lot of blue light, purple light, and green light from the stained glass windows. I like this idea. 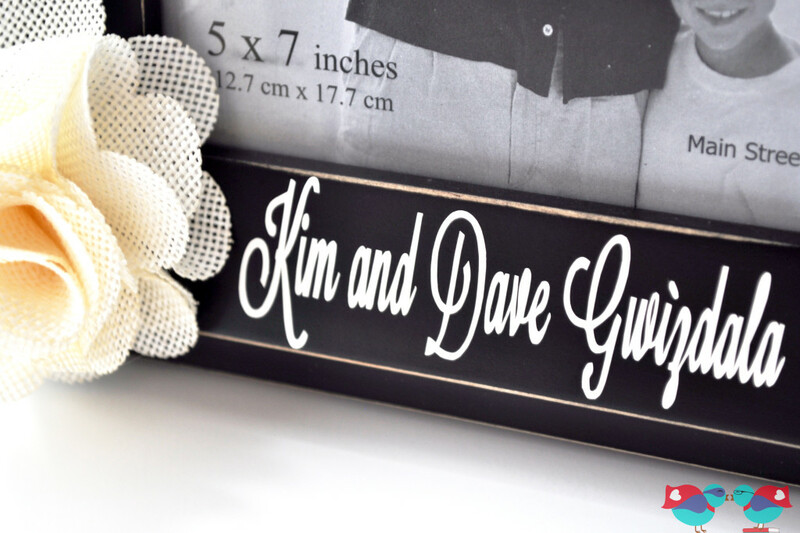 Pretty simple but such a thoughtful gift for a couple. Cute idea! I love personalized gifts, too. They’re often treasured more than something off of a registry. That looks super easy to do!